This quilt is a compilation of the orphan blocks of about 8 people. The only thing these blocks had in common was the color blue. I pulled all of these blocks out of the many that have been donated to our guild outreach committee and put them on the design wall to play with. At one point, this is what the design wall looked like. Even though I really liked that cute little house block, it did not belong here. Not enough blue! Once I had a general layout with the desired blocks, I started assembling and adding coping strips of a blue flowered fabric that gave me the spacers need to make it all fit. 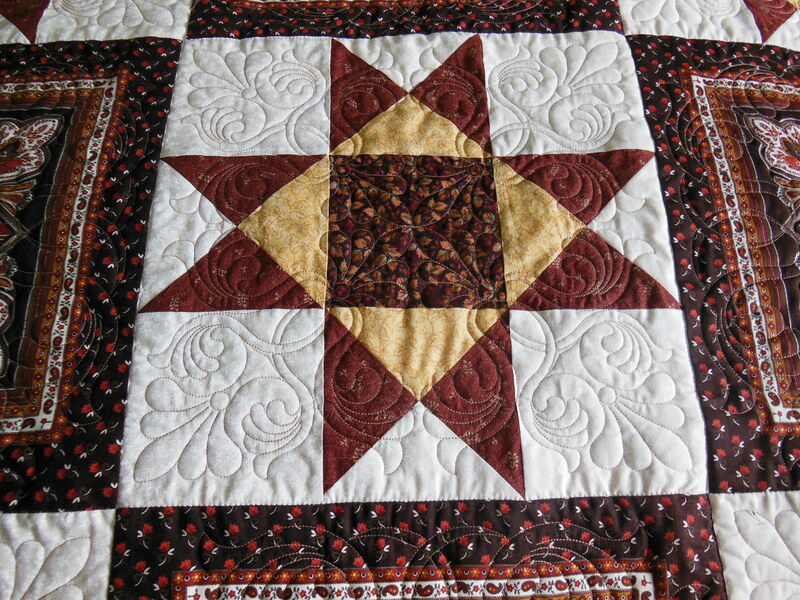 The quilt finished at 40″ x 45″ and I really like the look of it! I think what appeals to me is the challenge of making something nice out of found fabrics and blocks. It was donated to Victim Services, since they prefer to have small quilts. 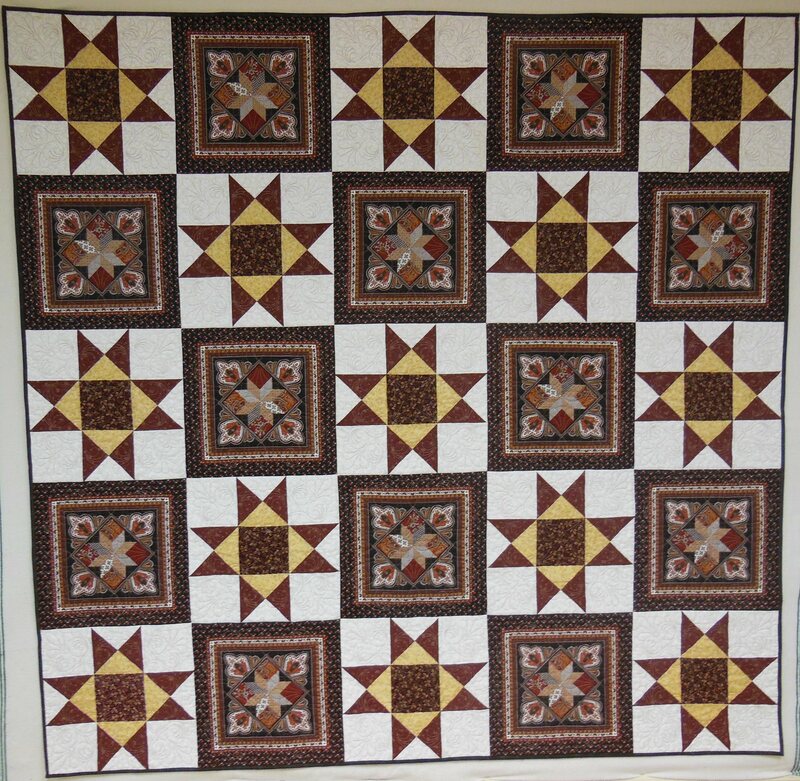 This orphan block quilt was made with some Hidden Wells blocks that were brought to my front door by guild member Beverley, who was cleaning out her house in preparation for a move. The blocks were already assembled, so I simply joined the rows, added the inner and outer borders and then machine quilted and machine bound it. If you look at the bottom row, you can see that the pattern does not fit exactly. Perhaps this is why these blocks ended up as Orphan blocks? Hidden Wells can be a tricky pattern! The finished quilt was completed within 4 hours. It has already been donated to Victim Services. Hopefully it will comfort someone in need. This simple candle mat was made from a block given to me from my friend Jacqueline. I quilted it with a walking foot on a domestic machine using MonoPoly thread. The binding is straight grain applied to the back and top stitched on the front. The finished mat was donated to the silent auction table at the Rosseau Fall Fair, where it raised some money to help with fair operating costs. 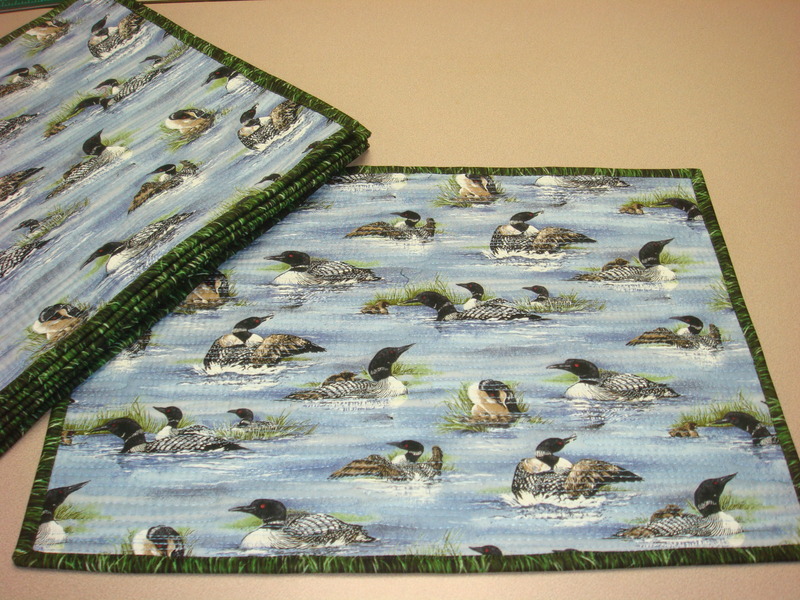 Our cousin Stephany, an avid birder, bought this fabric in April 2001 with the plan to have them made into place mats and a table runner. Ten years later, still in original yardage format, I convinced her to let me quilt and bind them for her. She told me the quilt store where she found the fabric, Village Fabrics and Crafts in Paradise, Michigan near where she lives, specializes in nature fabrics and is a real treat to visit. 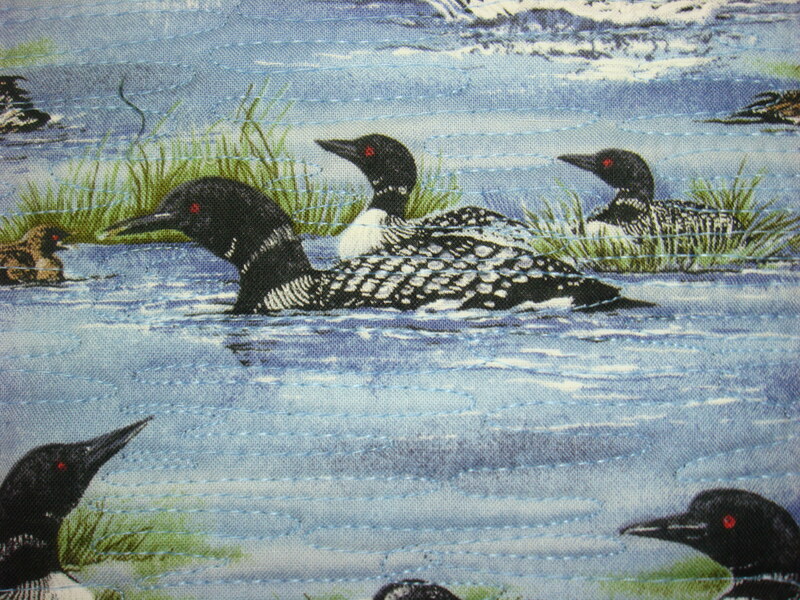 The loon print is by Timeless Treasures. The backing and binding fabric is Natures Glory by Moda. The binding matches the backing, making the place mats reversible too. The quilting is a dense freehand that resembles water ripples . The thread is a light blue poly with a dark Bottom Line thread in the bobbin. I made a point to avoid the heads of the loons, so the design is not obstructed. The placemats look good and I am pleased with how they turned out. 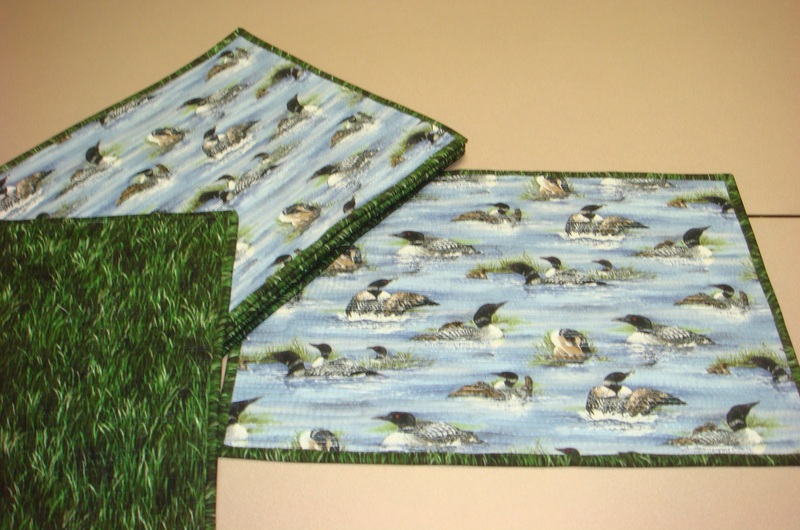 The set of 8 placemats measure 13″ by 18″ each. Goal Progress: This is the first project of the year. Even though I do not have my quilting goals set yet for 2012, I do know that fulfilling commitments will be high on the list. So finishing these placemats gives me a headstart on goal completion for 2012 and buys me a little pondering time as I figure out which of my own quilting projects are the highest priority.